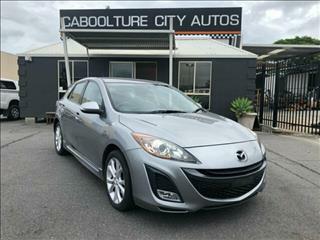 This Fantastic looking Automatic Mazda 3 Hatch in Aluminium Silver is a credit to the previous owner with Complete Service History, sporty and economical with the 2.5L 4-cylinder engine Great luxury features such as Satellite Navigation, Voice Recognition Blue Tooth, Premium Sound System just to name a few. A lot of car and amazing value for money !!! Call today to arrange a test drive We are a family run business operating from morayfield for the last 17 years with 5000 plus happy customers, we stand behind the quality and excellent value in all of our cars we are also RACQ Approved Dealership......This vehicle is supplied with a current QLD Safety Cert (RWC) and a clear title PPSR Certificate, we sell cars throughout Australia so they are advertised excluding Registration and Government charges. PLEASE Note our vehicles are advertised automatically through the Redbook code and are not specific to this vehicle. Please confirm all advertised details prior to Purchase, THANKS.